It looks like sparkling rosé, but this flower wine is something else entirely. A new Oakland-based winery is set to debut this week with a one-of-a-kind concept: small-batch wine made from flowers. Free Range Flower Winery’s founders are Aaliyah Nitoto and Sam Prestianni, who folks might recognize from the local music scene. The couple had been toying with the idea of turning Nitoto’s passion for making flower wines into a bona fide business for several years, and now it’s happening. The winery is starting with a lavender wine, made with locally and organically grown lavender and lemons. 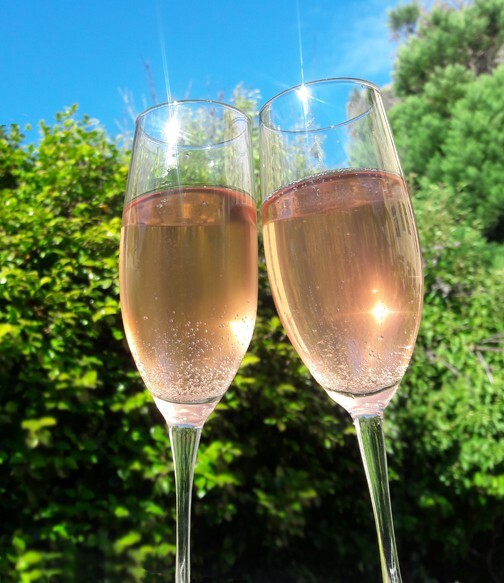 It’s best compared to a sparkling rosé, with complex flavors and a subtle sweetness. But it’s unlike anything most folks have tasted before. There’s a history of these so-called “garden wines.” Osmanthus and chrysanthemum wines are made in China and Korea, and dandelion wine is referenced in literature. It’s an old tradition that hasn’t taken hold at all in the contemporary United States. If all goes well, Free Range Flower Winery hopes to change that. “Our goal is to change the conversation around wine,” Nitoto said. Since they don’t have a tasting room, they will be partnering with local creatives, artists, and other makers on events to get their beverages out there. They also will be providing their wines to two local restaurants and bottle shops. The effervescent wine pairs well with brunch foods and savory dishes (though not acidic foods like tomato sauces) when served chilled. The winemaker is Nitoto, who is an herbalist and biologist. Nitoto started making her own flower wines and sharing them with the couple’s friends several years ago. “Making wine from flowers is something that I really enjoy,” she said. With Prestianni’s support and encouragement, they decided to turn it into a winery. Nitoto and Prestianni also realized it was something missing from the Bay Area food and drink scene — not a flower-infused drink, but wine actually made by fermenting flowers and other minimal ingredients in pressurized tanks. The alcohol level is 13.5 percent, which is about average for domestic wines. In the future, they plan to make wine from other flowers like rose, hibiscus, lilacs, and elderflowers. “Lavender is one of my favorite herbs,” Nitoto noted, adding that it’s a familiar food flavor nowadays with lavender cupcakes, lavender kombuchas, and lavender lemonade all commonly available. Nitoto and Prestianni will launch the new business on Friday, July 13, from 5 to 9 p.m. at Crooked City Cider/Two Mile Wines (477 25th St., Oakland). Customers can taste the wine and purchase bottles from their first 25-gallon batch — and the $30 bottles are discounted if you pre-order by July 12. Pre-orders can be picked up at the launch party or be home-delivered for free in Oakland and Berkeley with the purchase of three or more bottles through July 15. To keep track of upcoming events and tastings, sign up for their newsletter at FreeRangeFlowerWinery.com. Editor's Note: A previous version of this article stated pre-orders would be accepted through July 15. The correct date is July 12. The Express also removed the founders' band names due to privacy concerns.